The Year of France in Russia and Russia in France seem to reflect positive in business sphere of both countries. France has agreed to sell a Mistral class warship to Russia, despite concerns expressed by Georgia and other countries. Russia wanted to buy the 21,300-tonne helicopter carrier from France to modernise hardware that was exposed as outdated in its five-day war against Georgia in 2008. "France has agreed to sell one Mistral warship to Russia," a Defence Ministry official told reporters. France belongs to NATO and its willingness to sell Russia advanced technology that could be used in a confrontation with its forces or against its allies has caused concern among other NATO members. Several of Russia's neighbours have also expressed worries. Lithuania wrote to France in November asking for clarification of the situation and details of the ship's ammunition. 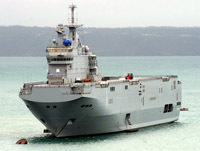 The Mistral, marketed by French naval concern DCNS and estimated by analysts to cost 300 million to 500 million euros, is an amphibious assault ship able to carry helicopters, troops, armoured vehicles and tanks thousands of miles. Despite a peace deal mediated by French President Nicolas Sarkozy, tensions remain high in Georgia. The region is viewed by the West as a vital energy transit route from the Caspian to Europe.